Though digoxin has been widely prescribed for decades to treat a variety of heart conditions, doctors have also long understood that, for some patients, the drug simply doesn't work. The reason, researchers discovered in the early 1980s, is Eggerthella lenta, a bacterium found in the guts of more than 30 percent of the population that can metabolize the drug in high enough quantities to render it ineffective. But how that process worked remained a mystery—until now. Led by Emily Balskus, Harvard's Morris Kahn Associate Professor of Chemistry and Chemical Biology, and Peter Turnbaugh, an assistant professor at the University of California, San Francisco, a team of researchers has identified the culprit gene that produces the digoxin-metabolizing enzyme. The study is described in a May 15 paper published in eLife. The study builds on an earlier paper that identified a pair of genes dubbed cardiac glycoside reductase, or Cgr1 and Cgr2, which showed increased expression in the presence of digoxin and other, similar drugs. "Those genes were associated with digoxin metabolism, but we hadn't actually shown they encoded an enzyme that reduced digoxin," Balskus said. "That's what we're doing with this paper." Besides showing that Cgr genes encode for the digoxin-consuming enzyme, Balskus said, the team found surprising evidence that the enzyme appeared to be specifically metabolizing the family of compounds which, like digoxin, are produced by the foxglove plant. "The plants themselves have been used in natural medicine for centuries," Balskus said. "They produce a number of compounds which, at lower concentrations, are useful medicines, but are toxic at higher concentrations. We tested five different members of this family, and we were surprised to find it specifically recognized these toxins." That finding was particularly surprising, she explained, because gut microbial enzymes might be expected to evolve to counteract molecules that might be regularly consumed, not drugs that might be taken on a temporary basis. "Before we characterized the enzyme, we were thinking digoxin reduction was perhaps a side reaction, that the enzyme's role was to do something else, but that it was promiscuous enough to be able to interact with these toxins," Balskus said. "But we tested many different substrates … nothing else we tested is processed by the enzyme. "At the moment, we're hypothesizing that perhaps this enzyme has an evolutionary role as a detoxification system," she continued. "Earlier in human evolution we may have been exposed to plant-based toxins more frequently, so that may have been the evolutionary role of the enzyme." The first step in drawing a line connecting genes from E. lenta to the enzyme and digoxin metabolism, Balskus said, was to collect as many strains of the bacteria as possible. "In our previous paper, we only had access to one strain," she said. "To really say that these genes are correlated with metabolism, we needed access to a larger set of organisms." Over the course of several years, Balskus and Turnbaugh worked with a number of colleagues to build a collection of 25 different strains of E. lenta and other closely related organisms. Seven additional strains were capable of metabolizing digoxin. "We were then able to look more closely at their genomes and say, do all these organisms have the Cgr1 gene and the Cgr2 gene?" Balskus said. "And we realized that they were part of a larger cluster of genes. We don't have any evidence at the moment that those other genes are important for digoxin reduction—they're not upregulated in the presence of the drug—but there was an almost perfect correlation between the presence of Cgr1 and Cgr2 and reduction." When Balskus and Turnbaugh transferred those genes into a different bacterium, Rhodococcus erythropolis, it gained the ability to reduce digoxin. Tests later showed that only the Cgr2 gene was needed to metabolize the drug. "We think Cgr1 is still important, but is probably involved in transferring electrons to Cgr2," Balskus said. "Cgr2 is where the active site is, it's where the drug is binding and where the chemistry is actually happening." To learn more about that chemistry, researchers purified the enzyme and discovered that the reaction required two "cofactors": an organic compound called a flavin, and a metallic iron-sulfur cluster to catalyze the process. "The iron-sulfur cluster was unexpected, because the Cgr2 sequence doesn't contain any of the known sequence motifs that are associated with that cofactor," Balskus said. "We did some spectroscopy … and learned a bit about how the enzyme works, but we don't yet know what that cofactor looks like or how it's incorporated into the enzyme." Other tests compared the Cgr2 sequence to other protein sequences in bacterial genomes and showed it to be very distinct from related enzymes and only found in E. lenta. Going forward, Balskus said the hope is that improving clinicians' understanding of how gut bacteria interact with drugs like digoxin can help lead to improved outcomes for patients. Additional work is needed to understand whether other drugs or antibiotics are also processed by the gut microbiome and how such transformations happen. 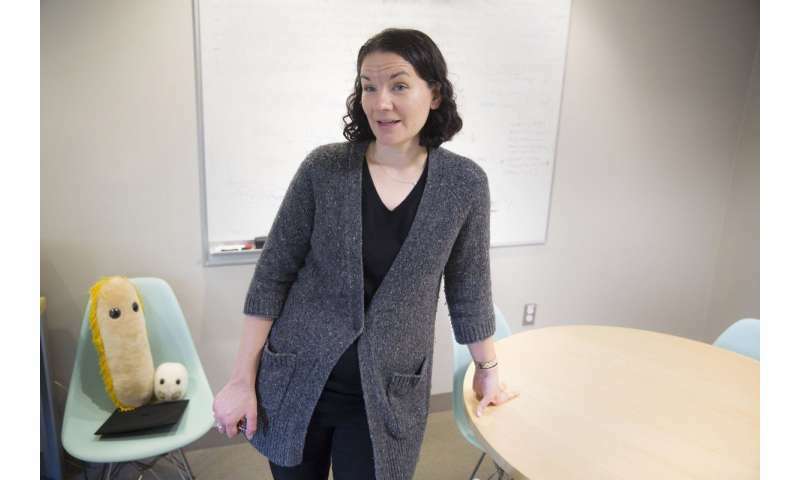 Ultimately, she said, understanding processes like digoxin metabolism is important because it reveals how the trillions of organisms that live in and on our body can have profound effects on human health and well-being. "Cgr2 is part of a group of enzymes that are actually very widespread in the gut microbiome, but for most of them, their function is unknown," Balskus said. "This suggests … that this type of reduction chemistry is a really important type of activity in the human microbiota, but we don't understand it very well. Some of those uncharacterized proteins might be very interesting to study if we want to uncover new ways that gut microbes interact with drugs and other ingested molecules."